Exiled from his homeworld of Chobe Prime, Melchob has risen to be one of the greatest KDF Generals currently in service. Being 404 years of age and armed with centuries of experiences in conflicts, Melchob's life has been tormented by nothing but war thanks to his species' war-like ways. Melchob's species, the Chobe, have been known to be highly resilient to pretty much all known infections and diseases throughout the Alpha Quadrant. Living for around 700 years on average, the Chobe are long lived and posses an extraordinary amount of intelligence due to their massive brain capacity. After being exiled in 2402, Melchob ran to the core factions of the Alpha Quadrant and believing the Federation-Klingon War to be a prime opportunity to regain his honour, Melchob joined the Klingon Empire because he believed it was the next best thing to the Chobe. After being enlisted into the KDF and heading through the Klingon Academy trials, Melchob worked his way through the ranks by displaying both extraordinary battle prowess, probably due to the fact that he is a Chobe, and leadership skills. As a result, Melchob eventually become a fully-fledged KDF General of the Klingon Empire. Melchob, realising that he would not stay on Qo’nos, decided to make his home on whatever ship he commanded starting with the I.K.S. Thegh’baq Hegh’ta Heavy Bird of Prey. Later, as his career progressed, he ended up commanding the I.K.S. NuQ’puv B’rel Bird-of-Prey Retrofit, the I.K.S. VaQ’baq Qin Heavy Raptor and eventually the I.K.S. VaQ’om’baq Vor’cha Battle Cruiser. Melchob’s continuous stream of success has allowed him to gain a reputation of being one of the most dangerous allies of the Klingon Empire there is, many simply putting down to the fact that he is a Chobe. However, many also believe that Melchob is naturally gifted in combat, not because of his Chobe heritage, but because of his ability to read combat situations almost instantly. 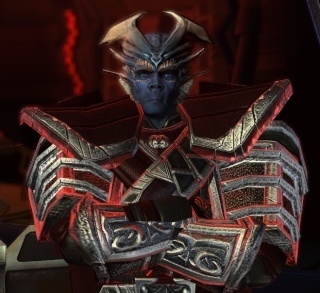 Melchob is now the commander of his own division of the KDF and leads them in the hunt for Ja’Dok. With his influence and abilities, Melchob’s division has grown to be one of the largest in the Empire, and many rivals within the Empire have become jealous that an outsider has become a better General than they. Last edited by Ooiue; 19th May 2015 at 03:03 PM.